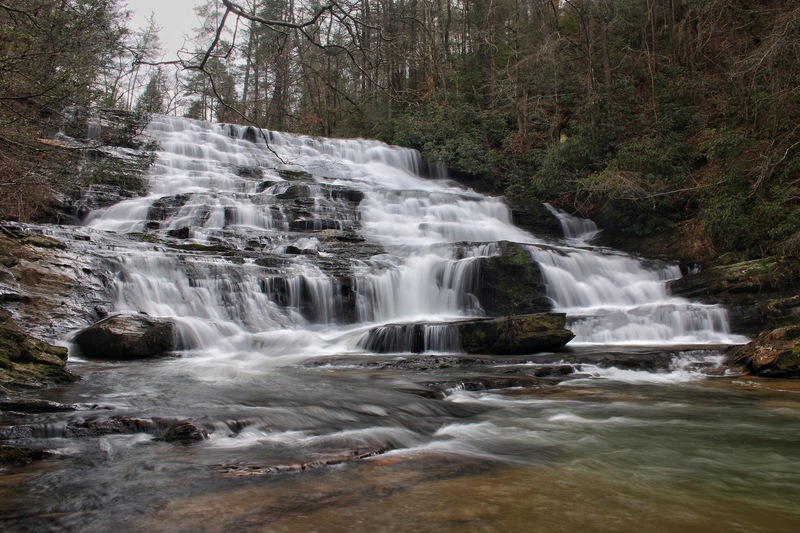 Brasstown Falls is a unique setting of 4 very cool, interesting, beautiful and different waterfalls located very close to one another. 3 of them are on Brasstown Creek and 1 is just upstream on the feeder stream Little Brasstown Creek. 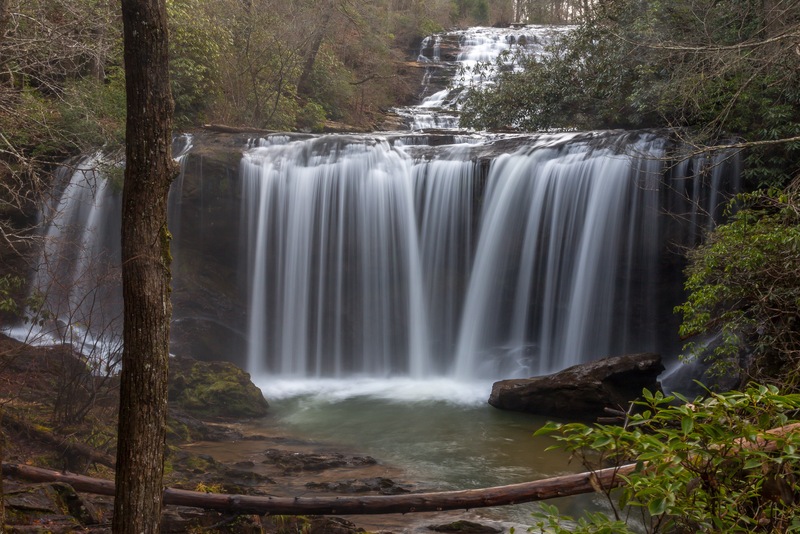 Brasstown Falls was the destination for one of my trips to South Carolina in 2014, that thanks to bad traffic jams, taking different routes than planned and just running out of daylight, I ended up at Station Cove Falls. It wasn’t a total loss. After that, I kind of forgot about Brasstown for awhile. 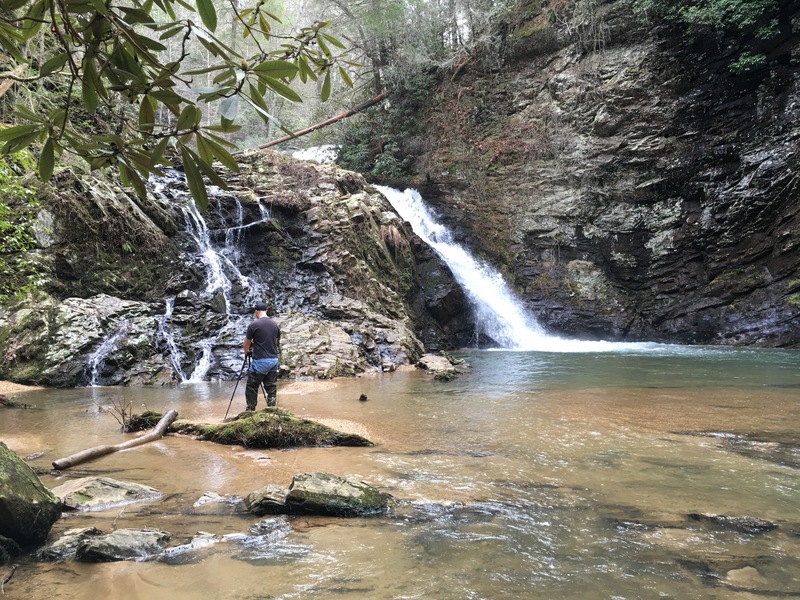 It is on the Carolina Mountain Club’s Waterfall Challenge 100 list that I have been steadily working down for a few years now. Sooner or later it was going to come up again. 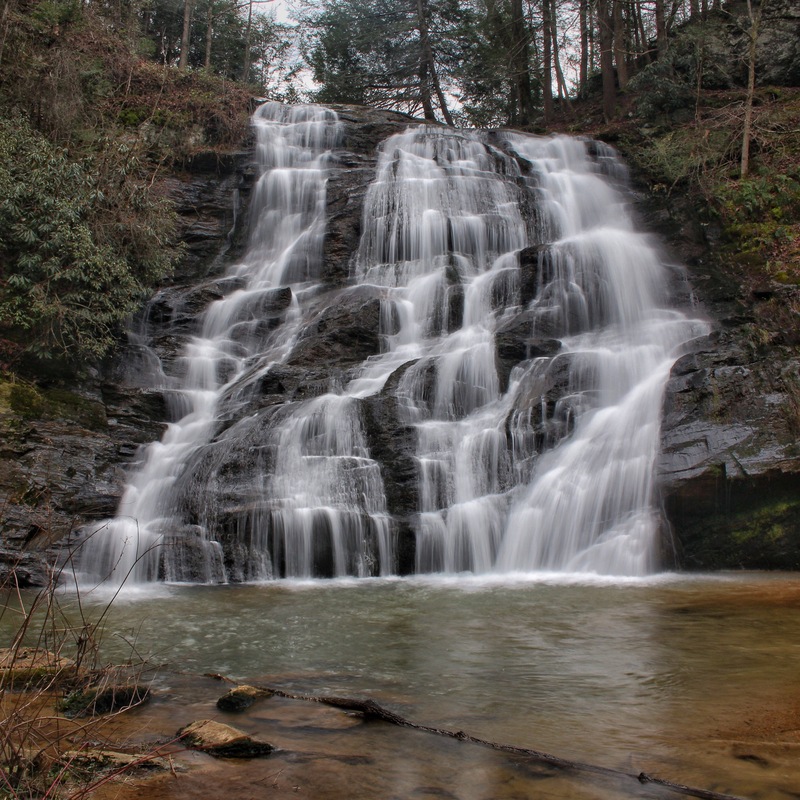 A recent trip to Sids Falls in Oconee County, SC with some friends brought me very close to Brasstown Falls and it came up on the radar screen again. 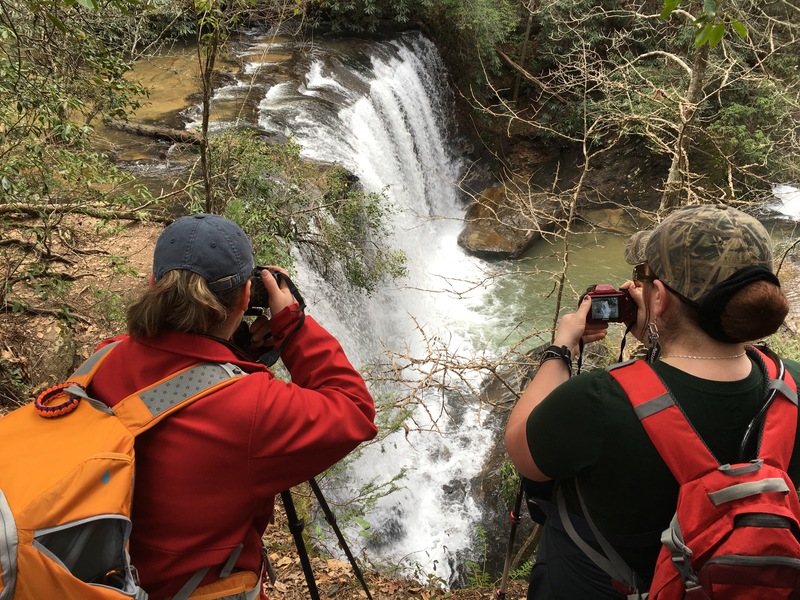 I had heard some great things about Brasstown Falls. It was time to plan an overnight trip and come and visit this one. 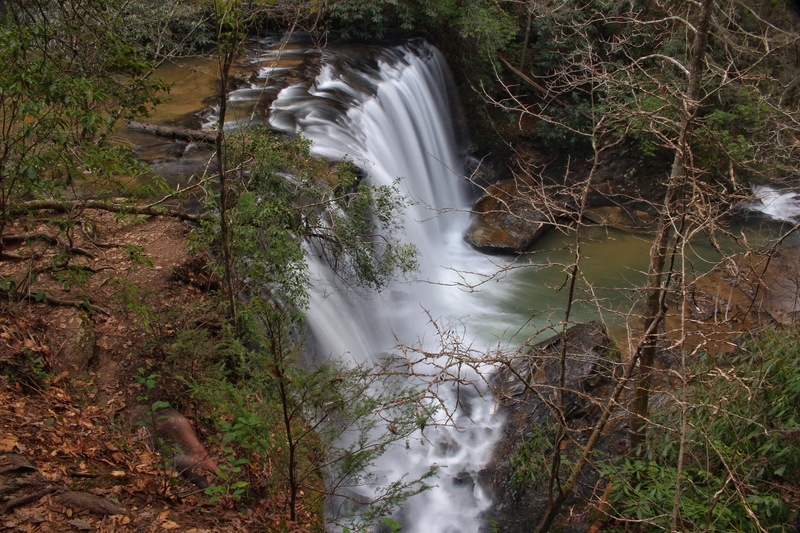 Brasstown Falls is located in extreme western South Carolina just off of Brasstown Rd. It is not really near any big towns , but it would be best to say that it is about halfway between Westminster, SC and Clayton, Ga along US 76. The best access to Brasstown Rd is the intersection with US 76 about 5 miles east of the Georgia / South Carolina state line. There will be a brown sign indicating Brasstown Falls here. I am a big fan of the brown waterfall signs in South Carolina. They have led me to some memorable places that were not planned. Anyway, I had met a friend in Clayton, Ga the day before. Daniel Jack Hutchinson from Tennessee, also lives far enough away that it was much more convenient for him to stay closeby overnight. 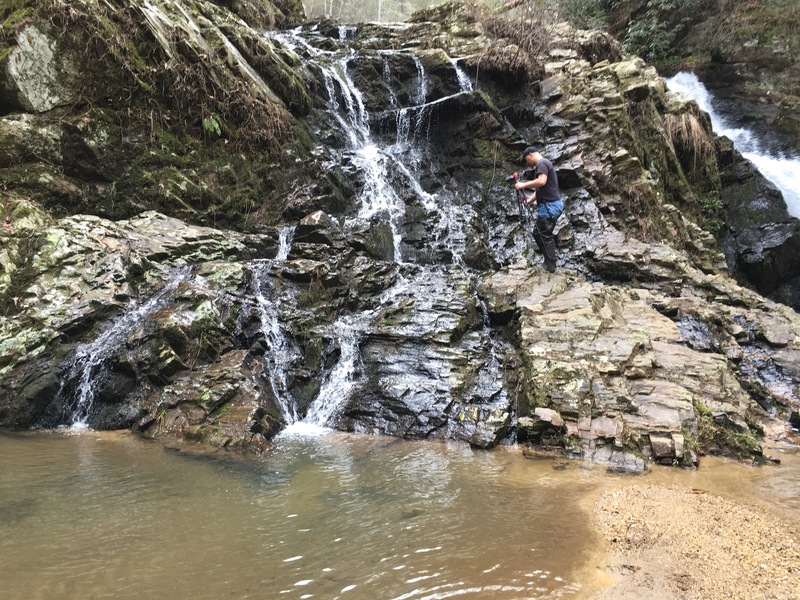 He took me to some very nice waterfalls in northern Georgia. He had been here before and knew the area well but for some reason, I was leading the way down the 4 miles on Brasstown Rd that starts paved and turns to gravel. I kept looking for a sign for the right hand turn but never saw it, and was soon heading up a mountain on a narrow dirt road. Eventually, Daniel Jack Hitchinson flicked his lights at me. We stopped and he told me that I passed it 2 miles back. I said WHAT??? He just wanted to see how far I was going to go. So we turned around and made the turn which should have been a right turn…not signed, but just before a 1 lane bridge. 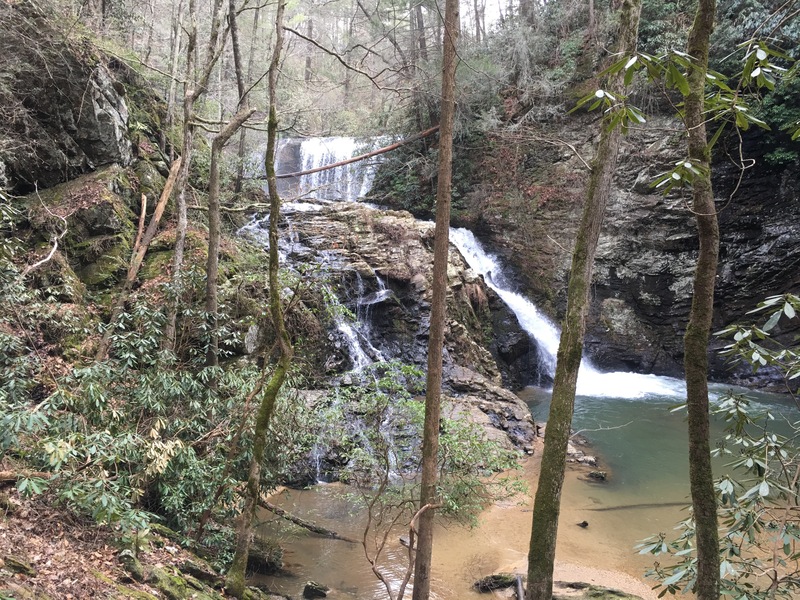 Nice…..Anyway, the goal today was to meet up with 5 more people at Brasstown Falls, take in the scenes and enjoy Brasstown fully, …and then maybe another location. Within moments the North Carolina waterfall shuttle arrived with Beth Bradshaw, Stephanie Leigh, and Hector Gutierrez. Renee Hattenstein, also joined us for this hike. This short hike, that begins just beyond the boulders lining the dead end road parking area, leads to moving water fairly quickly. Within 1/4 mile or less, the flat trail turns right as does Brasstown Creek here. As the trail begins heading down, so too did the water and just like that we were walking down the side of Brasstown Cascades, a nice 50 foot set of cascades. 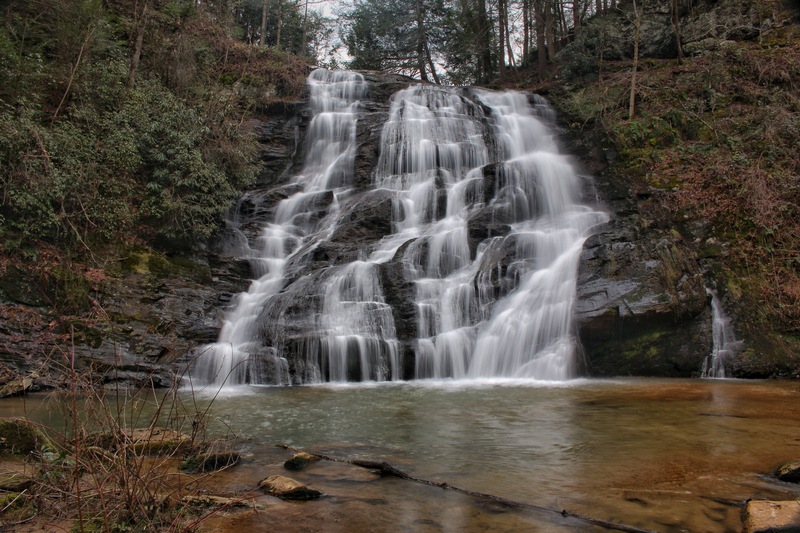 Just beyond the 45 foot cascades, we passed the 35 foot Brasstown Veil. We decided to go to the bottom first and the photograph the waterfalls on our way back up. This was hard to do, but I was patient. The trail was becoming more narrow, steep and tricky. 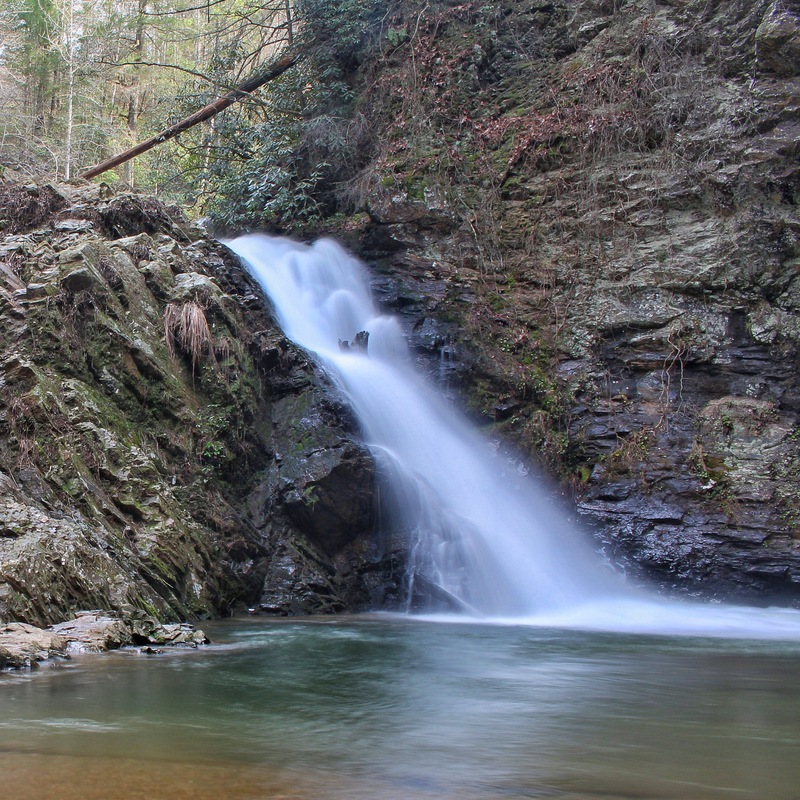 The last section heads down to the 35 foot Lower Brasstown Falls. Daniel Jack…usually the first down at the waterfall to set up! 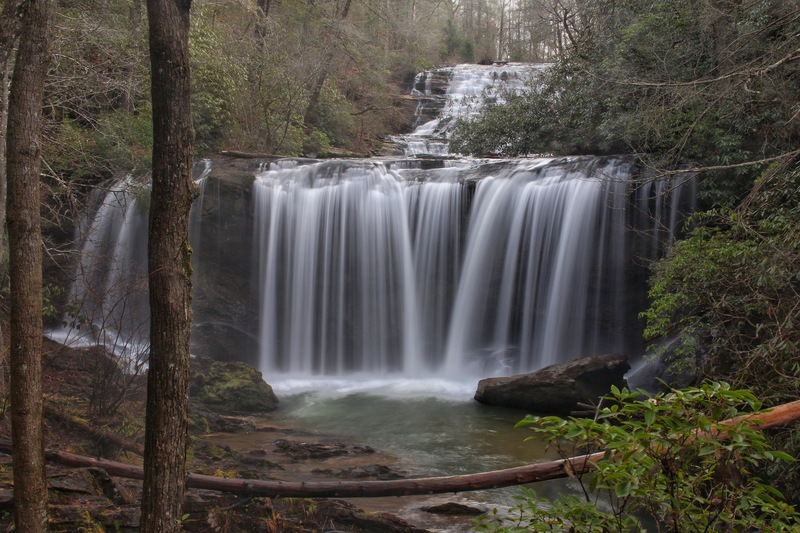 The bottom waterfall is Lower Brasstown Falls or Brasstown Sluice. Getting down here is increasingly tricky, especially once past the Brasstown Veil. Everyone made it fine though, and once down we all spread out to get our photos. Daniel came prepared for this one, wearing his hip waders to venture out into the stream. Me, I just took my shoes off and froze. 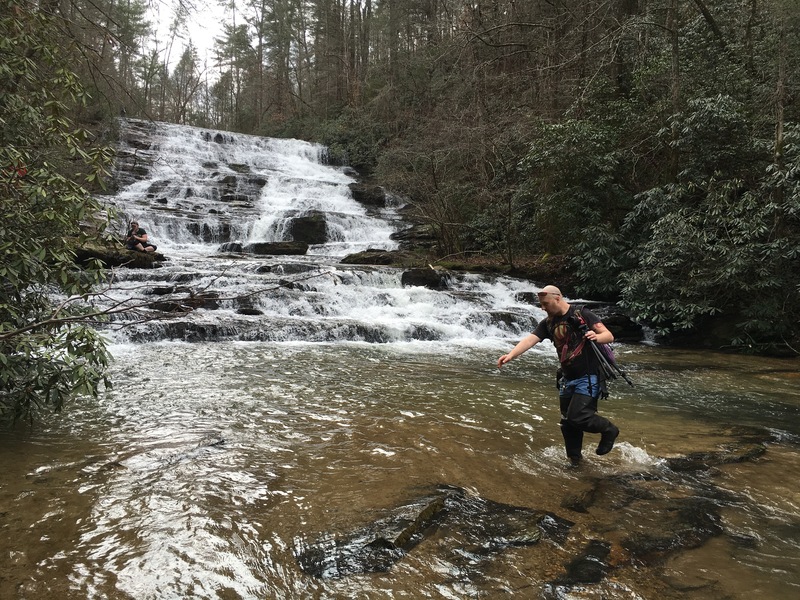 Everyone else managed fine along the shore, until we got up to Little Brasstown Falls. 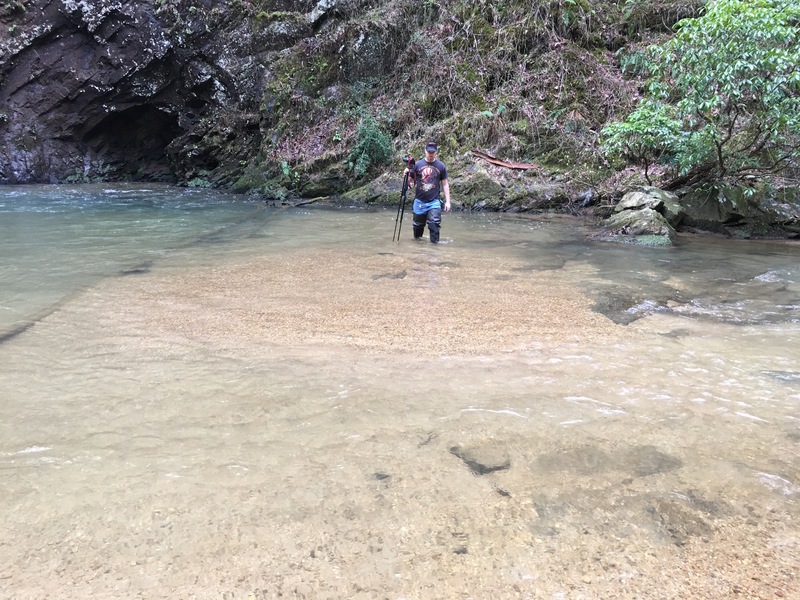 We eventually began making our way back upstream towards The Brasstown Veil. It wasn’t far, as both can be captured in one photo. 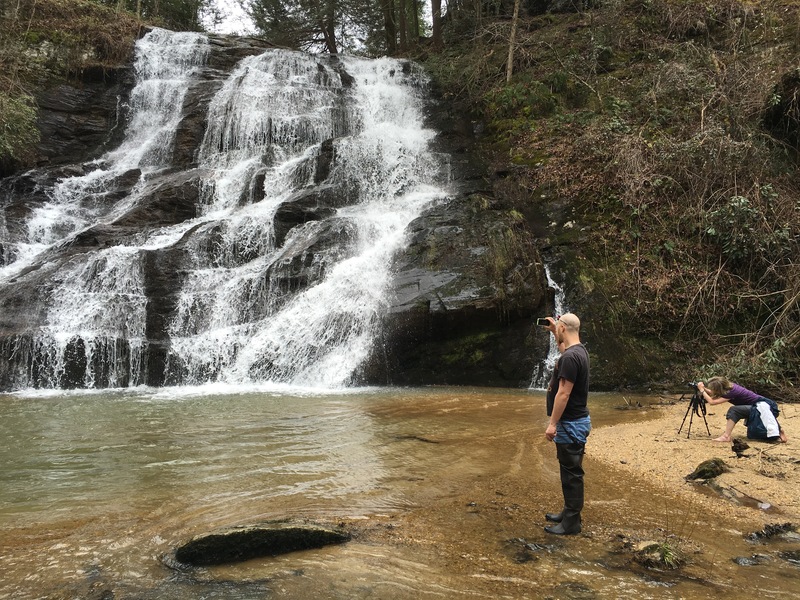 Getting the right spot to take some photos of the Brasstown Veil without excess spray was a challenge, but the 35 ft tall, stream wide fall was certainly my favorite one here. This one was gorgeous and there were also some nice views from the side as you continue your way back up. 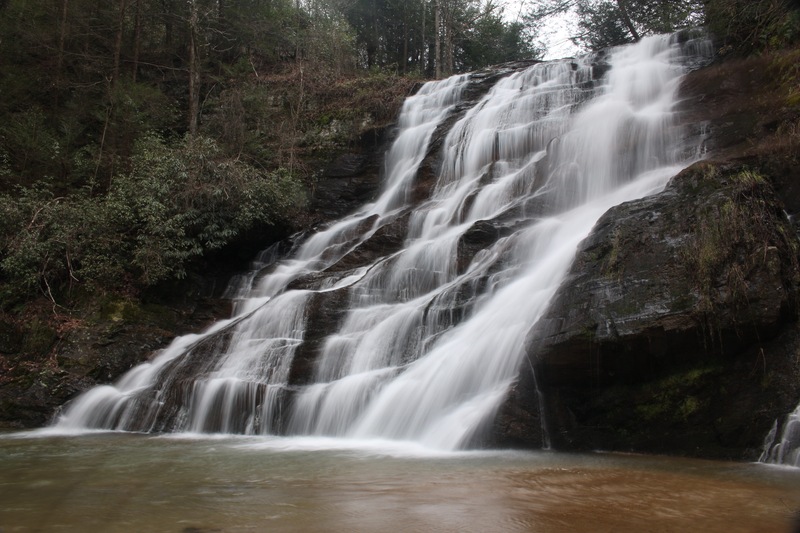 Once at the top of the Brasstown Veil, the next attraction Brasstown Cascades is in full view. At 45 feet or so, this one is the largest drop of the Brasstowns, and a nice, noisy cascade. Daniel doesn’t need rocks to hop along with the hip waders! 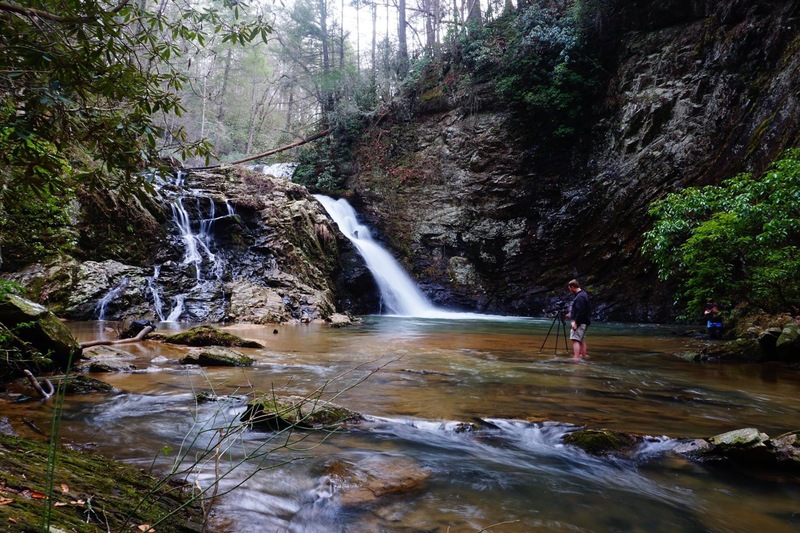 Back above the Cascades, as you head back towards the car, there is one last treat waiting at Brasstown Falls. Instead of turning left back to the cars, continue straight. Brasstown Creek makes a sharp turn back to the left here and must now be crossed. There is no way to do this dryly. 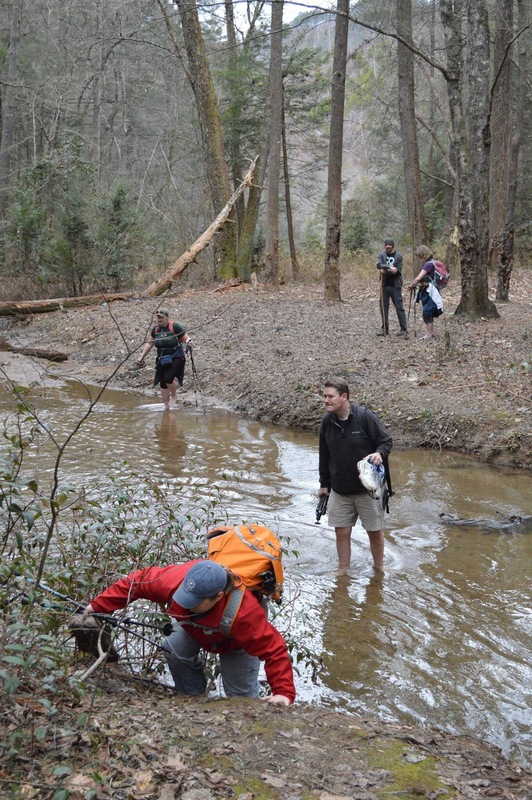 Everyone that hesitated to take their shoes off at Lower Brasstown, were now shedding layers. Beth had mentioned that this one was her favorite one here at Brasstown. I can certainly see why! 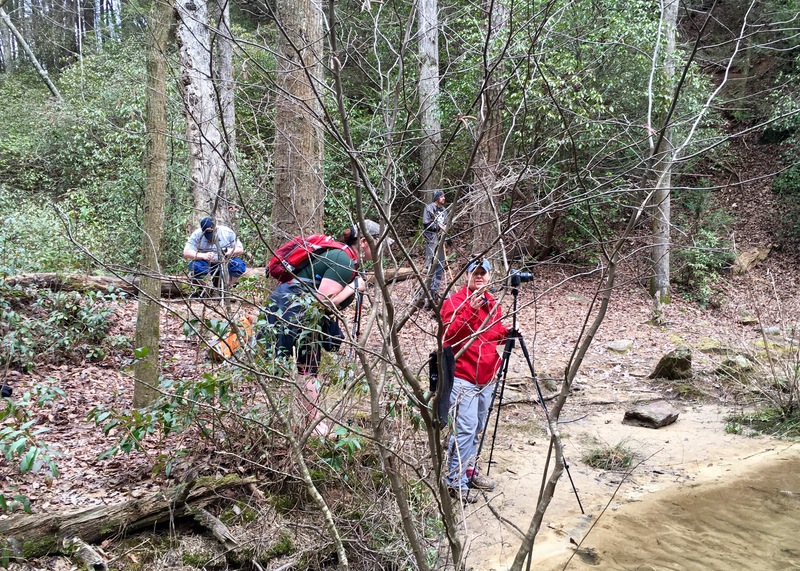 Here is an image from Daniel Jack Hutchinson showing myself and others in this group making the trip across Brasstown Creek. The water is fairly deep all around this area and the mud in the stream was the kind you just sink a foot in. There was no way to do this without getting dirty. 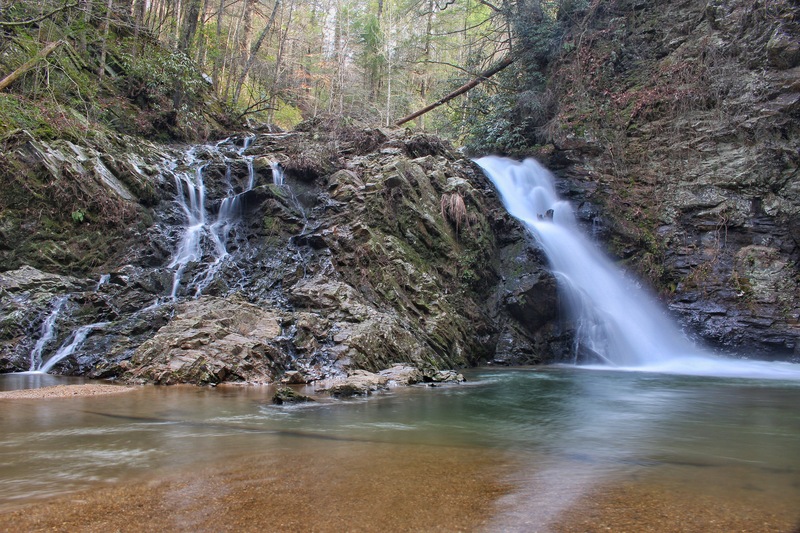 But there is a beautiful waterfall on the other side of Brasstown Creek, on Little Brassrown Creek, just before they join. It is certainly worth making the crossing. 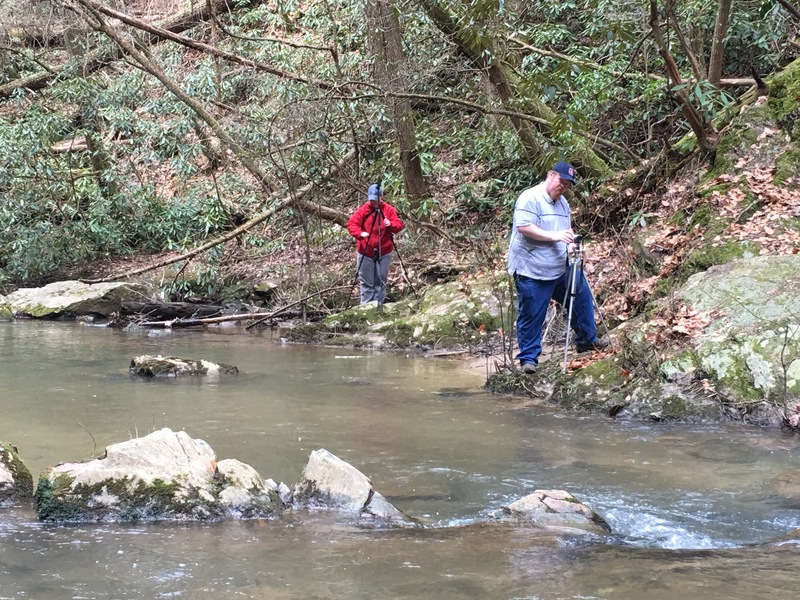 After Little Brasstown Falls, the creek must be crossed one final time and head back. 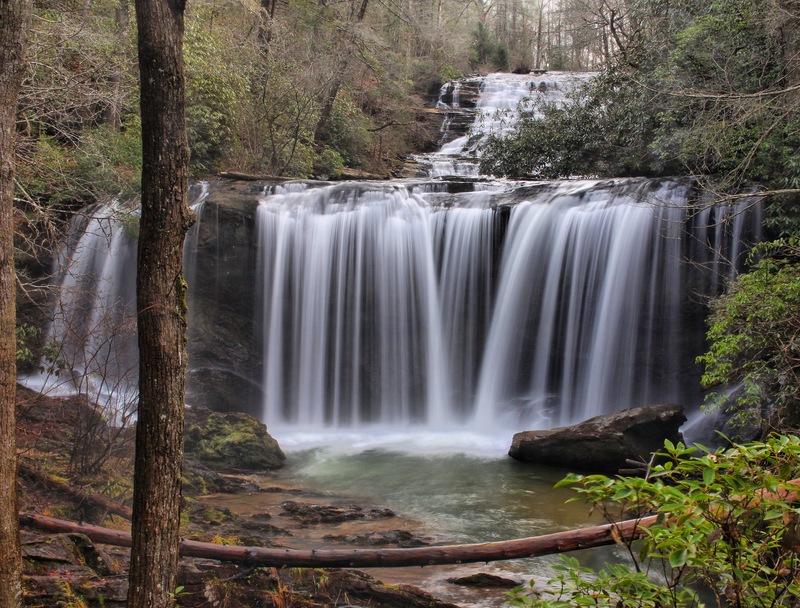 Brasstown Falls packs 4 great waterfalls into a small area and is definitely worth visiting. Here is a short YouTube video showing each waterfall. To close out, here are some of my favorite shots from Brasstown Falls!